Reporting functionality in the Beehive helps you to analyze your projects in ways that can show the status of current projects and the properties of projects from as far back as 2010. You can view data across project types, territories, labels, requestors, artists and more. All reports are downloaded and saved as Excel spreadsheets so you can further sort your data. Let’s have a look at how we create, edit and run reports in the Beehive. To view your reports, click on the Reports tab in the amber bar next to My Projects. Here you will see all the reports that are currently available to you. There are three default reports that have already been created for you. Video Project Detail [All] - This gives a detailed list of every video project in your account, including Label, Artist Name, Video Name, ISRC, Frame Size, Frame Rate and Duration – all of the deep details regarding your video. It also lists its status (pending, in progress, etc.). Video Project Status [All] - This is a brief overview of all videos in the specified time range. It is useful in determining the state of your video projects without the more technical details included in the first report. Video Project Status [Incomplete] - This report shows the status of all open or aborted videos. It is also a brief overview of your projects. To view a report, simply click on Run Report on the right-hand column of the window adjacent to the report you’d like to see. You’ll be prompted to enter a date range (we’ll talk more on date ranges later). Once you click Run Report, you will be prompted to name and save the report. You can then open the report from your browser’s Downloads window, or through your OS. You can now use Excel (or any other spreadsheet application) to inspect, sort and further manipulate your data. Perhaps the default reports are almost to your liking, but not quite. That’s okay – you can edit the ones that already exist and make changes to them that better suit your needs. NOTE: We strongly recommend cloning an existing report before editing it. That way you can always go back to the original report if things get too complicated. To clone a report, click the Clone button next to the report you wish to duplicate. Confirm that you would like to clone it by clicking OK in the dialog box. A new report will appear under the original with the same name amended with the word copy. Next, click on the Edit icon (the blue pencil) to the left of the report’s name. This will open a new page with two columns. The columns on this page are the fields (properties) that are available to be reported upon. The left column represents fields that are not included in the report, and the right column contains the fields that are in the report. These will become the column names once you run the report. To add a property to the report, select the desired field in the left-hand column and click the Add button. You can select multiple fields at once by holding down the shift key or command key and clicking the Add button. To remove a property from the report, select the unwanted field in the right-hand column and click the Remove button. The columns will appear in the report in the same order viewed in the right column. The right column will display the fields in the order in which they are added from the left column. To change the order that the fields will appear in the report, select a field name and click the Up or Down buttons until the field is in the desired position. Once you have selected your desired fields, click the Next button at the bottom of the page. This is the filter page. This page allows you to narrow down data in your report based on values that you select. In this example, the only variables we are filtering for are Project Type and Due Date. Our report will display one of the three selected project types whose due dates fall within the displayed range and ignore all others. Any field name that is not filtered will display its value in its corresponding column in the report. Fields that are blank, lists that display “Please Select” and lists that contain no highlighted values are all unfiltered fields. 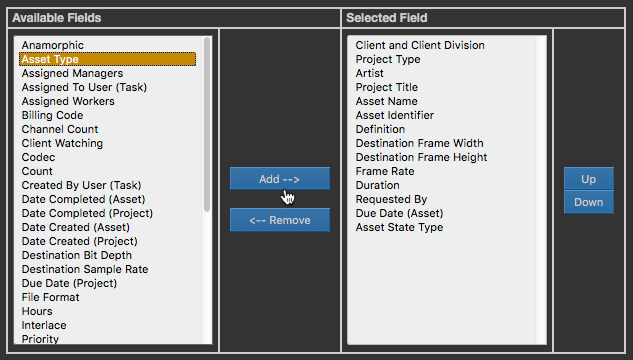 If you would like to filter for all aborted projects here, for example, you would select Aborted in the Asset Status Type field and select Next. Sometimes we may want to report on a particular client or division or a single project type, but we don’t necessarily need for it to display as a column in our report. Let’s say I’m reporting on Video Archive & Encode (VAE) projects only. I’ve selected Video Archive & Encode in the Project Type field, but when I run my report, a column called Project Type will be created, and all its cells will be populated with the title Video Archive & Encode. This is meaningless, as I already know it’s a VAE report. To prevent this superfluous column from displaying in the report, we can click the Suppress Column box before selecting the Next button. This page displays a summary of the search parameters we selected on the previous page. It also allows us to name the report (required) and include a header or a footer on the report itself (optional). There is also a checkbox on this page called Filter Empty Count, Duration and Hours. 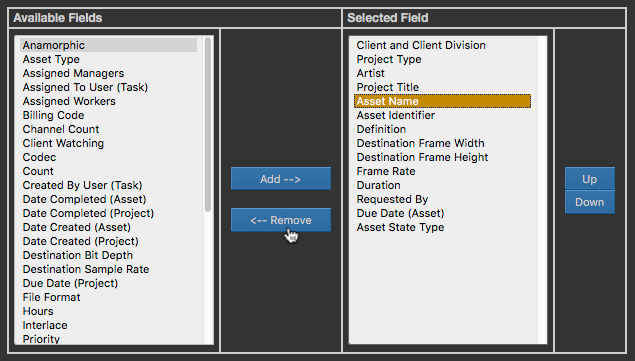 This button prevents duplicate assets from displaying in a project where those values are missing from a task. For most reporting purposes, we will not need this checkbox. Once we’ve named our report, it’s best to save it. 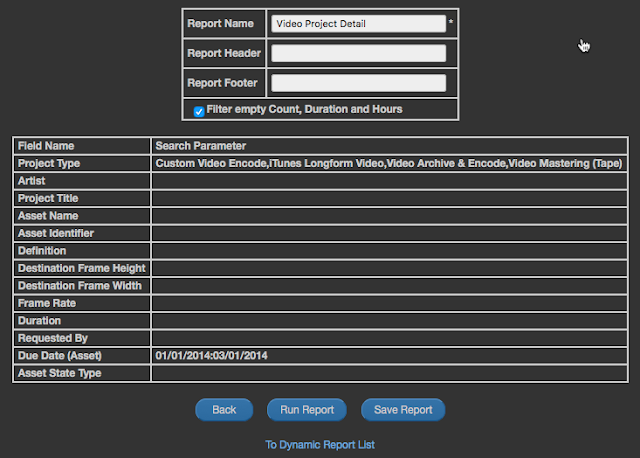 We can run the report from this window, or using the Run Report button on the main Dynamic Report page. You’ve probably noticed that some field names on the Field Selection page (page 1) are the same, but they refer to Project instead of Asset or Task and vice-versa. 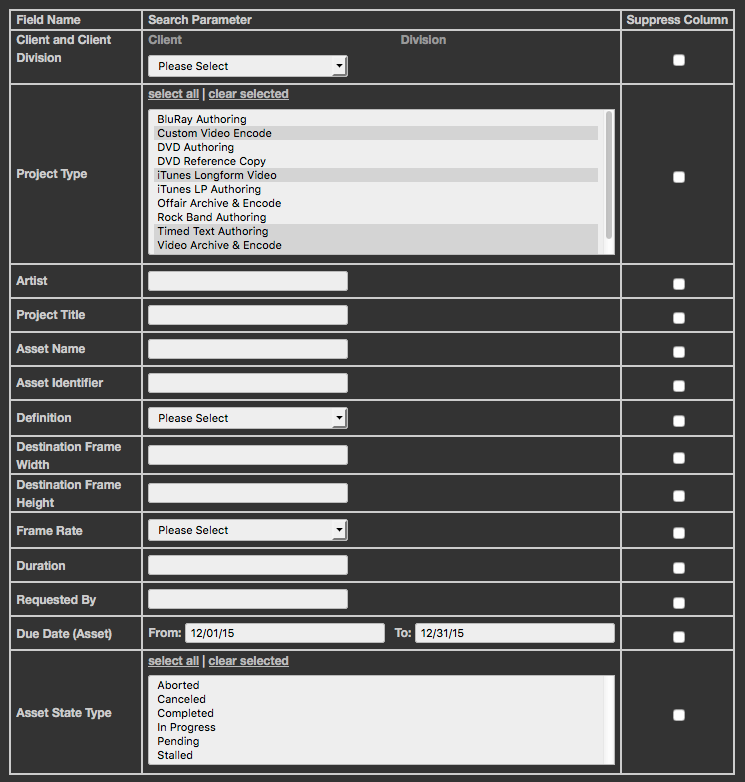 Consider Date Completed (Asset) and Date Completed (Project) for example. Here’s what they mean (and this is where things can get confusing). The Beehive is a project-based management system. A project can be as large and complex as filming, editing, designing and authoring a Blu-ray/DVD combo or as simple as ingesting a music video for distribution to iTunes. The majority of Beehive projects are simple video projects. When we expand the asset, we see all the tasks associated with the asset in their various states of completion. All tasks in this project are complete. Typically, we report on things that are complete, whether they are projects, assets or tasks, but sometimes we want an update on projects in progress. For a broad overview of current projects, we’ll report at the project level, say, to see what projects are still open and why. The default report called Video Project Status [Incomplete] does this. It looks at all project types that are related to video and considers all Asset State Types besides the completed ones. The more data we want about projects, the deeper we dig in to them. This is done by searching for data about tasks. Warning: running reports on tasks without filtering them in the Filter Page will result in a single line of data for every task associated with a project. This means that the report will display about 6 – 10 duplicate rows for each project. It’s best to select one task type on the Filter Page in order to return a single line per project. Most reports are run by selecting a date range. In fact, the Beehive’s reporting interface was designed so that its users can create report templates whose only variables are start and end dates. It is possible to create a report with multiple date fields, such as a due date and a completed date. When reporting on multiple date data, it is important to remember that date filters are independent of each other. If, for example, we searched for projects that were due in July 2015 and projects that were completed in June 2015, we would come away with a blank report. For this reason, it is best to only use one date range as a filtering parameter. Leaving one range blank will allow for all date ranges in its field, but the report will still be restricted to the date range defined in the other field. You can create and save as many reports as you wish. Please feel free to experiment with your reports and explore the many different options available to you through Beehive reporting. If you are having difficulty getting the right data to show up in a customized report, feel free to reach out to us, and we’ll help you get it right. We are very pleased with the power and flexibility of the Beehive’s reporting tool. We feel that it is a tremendously valuable asset that will help you manage data associated with your content.